One of the hottest new bathroom and kitchen trends for 2017 is undoubtedly the Kraus line of sinks and faucets. With clean modern designs and timeless style, it’s no wonder the Kraus line of sinks and faucets is one of the hottest plumbing product lines being installed in Miami new construction projects in 2017. For consumers, this equates to styles and features generally found in high-end sinks and faucets at a price accessible to a wide variety of budgets. 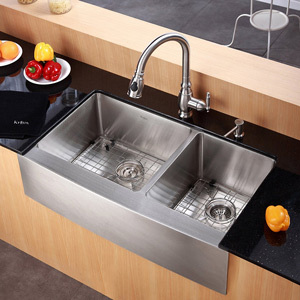 Our kitchen and bathroom showroom in Miami carries working examples of the most popular Kraus sinks and Faucets. Stop by the shop to see them in action, or contact us for more information today! The Water Rainbow® Flow bathtub filler is one of a kind and sets it apart from its competition. Its sleek and chic design has the looks and functionality. 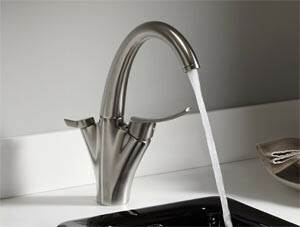 Its 8 ½ wide spout brings drama to the forefront of faucets and creates a waterfall effect. The minimum flow rate of 9 gallons per minute allows the bath tub to be filled quickly, which gets you in your relaxing bathtub faster. The spout is made of sleek and sturdy brass with metal handles in the shape of cubes to tie in with the overall theme. This one of a kind faucet comes in three gorgeous finishes; polished chrome, white and brushed nickel. Come take a look at the different finishes in our Miami plumbing showroom and see the Water Rainbow® Flow in action for yourself! With Moen’s new customizable shower technology and personal device integration, you control it all: time, temperature and how your day begins. Take a little tour of features and designs below, or stop by our Miami showroom to try out U by Moen for yourself. Customize your shower experience before you step in. With a connected app included, you can set the perfect temperature directly from your smartphone or connected device. Save personalized settings to easily duplicate the perfect shower every time. With device notifications you can set custom preferences to alert you when your shower is ready. 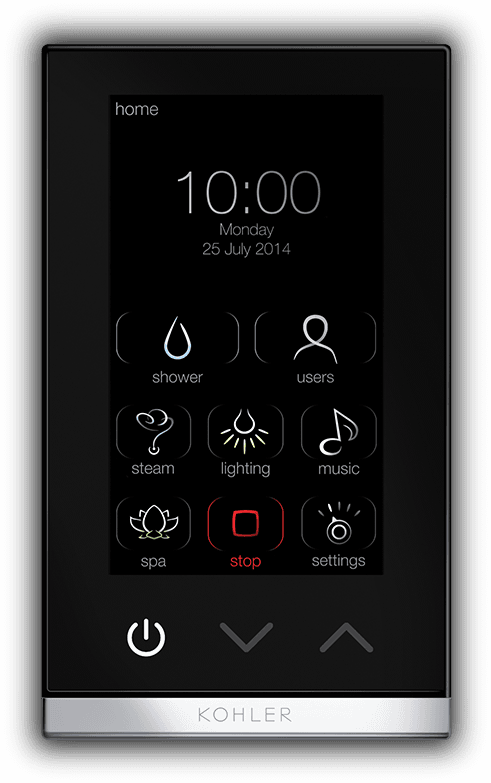 Using the app allows you to start your shower or pause it to avoid wasting water (and time). Time your shower perfectly to find a little extra room in your morning schedule. Come see the U by Moen Smartshower in our Miami showroom and speak with our knowledgeable to learn about installation and and configuration options. Magnetix™ handheld showers are the first Moen products to include magnetic docking, which allows for easy release and securely snaps back into place – even when your eyes are closed. 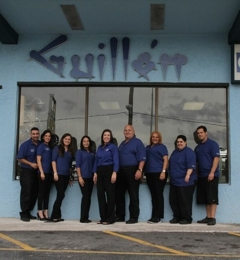 Guillen’s Plumbing Showroom in Miami has working examples on display so you can feel the difference for yourself. Moen’s Magnetix™ shower features an innovative magnetic docking system that detaches easily, then returns back in place with a telltale snap that lets you know it’s securely reattached. With no cradle or clip on the shower arm, it is a stylish fit for any shower and offers an extended reach that takes the stress out of tasks like cleaning your kids or pets. 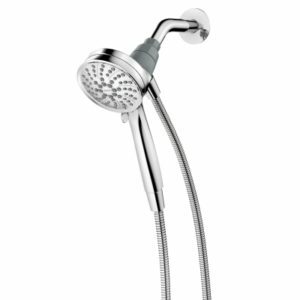 Offered in an array of different styles and finishes with multiple showerhead options, Moen’s Magnetix™ has the timeless style to finish any new bathroom design, or add life to your existing shower. Stop by our Miami plumbing showroom to feel and see the difference for yourself. With its concealed tank and minimal footprint, the innovative Veil wall-hung toilet saves up to 12 inches of precious bathroom space over KOHLER’s longest floor-mount models. The mounting hardware is completely concealed, giving Veil a sleek, seamless look that is incredibly easy to clean. And with dual-flush technology, this high-efficiency toilet can save as much as 6,000 gallons of water annually over a traditional 1.6-gallon toilet. 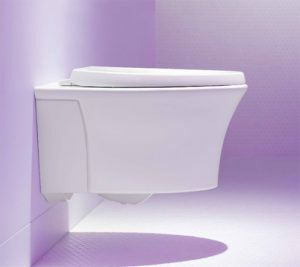 Includes Reveal® Quiet-Close™ seat, wall-hung bowl, flush actuator, and in-wall carrier. Durable steel frame for 2″ x 6″ installation. When installed per Kohler’s installation instructions, the Kohler in-wall tank and carrier system can support up to 880 lbs without damage. 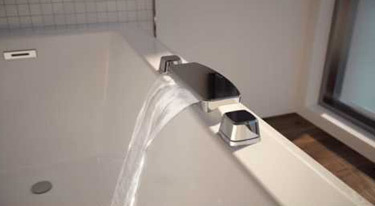 Learn more about this product here or stop by our Miami plumbing showroom to view it in action. 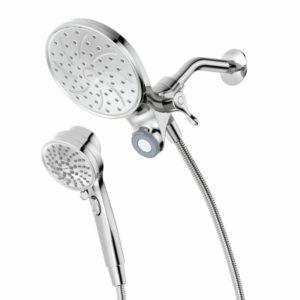 Kohler’s latest multifunction showerhead and handshower with Katalyst® air-induction spray to create large, full drops. Inspired by the graceful curves of nature, the Exhale showerhead and handshower places an array of shower experiences at your fingertips. Simply rotate the sprayface to select from three distinct water sprays: full coverage with large, air-infused drops; drenching rain for a soothing downpour; or pulsating massage to ease body aches. Exhale’s sleek, organic design blends in beautifully with any shower space. Showerhead features transitional design inspired by nature. Advanced spray engine provides three spray experiences: full coverage, drenching rain, and pulsating massage. Full coverage spray produces an encompassing spray for everyday use and utilizes Katalyst® air induction to create large, full drops. Pulsating massage spray targets sore muscles to ease away aches and pains. Full 360-degree rotation of entire sprayface cycles through spray functions. Silicone sprayface is easy to clean. Experience the difference for yourself. Visit our Miami Plumbing Showroom to view a demonstration of the Exhale™ Showerheads and Handshowers or contact us for more information or to purchase. Home Water Filters and Purification Systems in Miami | The Best Way to Get Clean Drinking Water. Comments Off on Home Water Filters and Purification Systems in Miami | The Best Way to Get Clean Drinking Water. Clean drinking water for your home or business is well, essential. When it comes to where you get your drinking water, not all sources are created equal. While bottled water or pitcher filters may be convenient, you may not be getting the filtration you expect. Bottled water plastics can expose you to nasty chemicals from plastics, and pitcher water filters can fail to catch impurities like heavy metals and fluoride. This is also true for the water you use to bath and brush your teeth with. So what’s the best and easiest way to get clean water in your home? In addition to convenience, “under sink” or “under counter” multi-stage filters offer perhaps the cleanest, healthiest and best tasting water. Options range from drinking water filters for the kitchen or bathroom to whole-house filters. Call 305-226-7855 or visit Guillen’s Miami plumbing showroom to learn more about water purification options for your home. Whether for your kitchen, bathroom, wet bar, or whole home– we carry all the top water filter systems and can guide you to right system for your needs. Kohler’s line of massage tubs bring a whole new level of relaxation to bathing. With BubbleMassage™ Air Bath technology installed in all Kohler massage tubs, you can get a relaxing massage every time you use your bath tub. Guillen’s Miami plumbing showroom has the latest styles on display in our Miami showroom. Airjets placed throughout the tub release thousands of air bubbles, massaging your body at the level of intensity you prefer. A cutting edge electronic keypad allows you to fine-tune your bubble massage, while enjoying it’s traditional design. Ready to shop or browse your Massage Tub options? Call or stop by our Miami showroom today and speak with one of our trained staff members and find the hydrotherapy tub that is right for you. Kohler’s New DTV+ Could Be the Most Advanced Showering System Ever. Comments Off on Kohler’s New DTV+ Could Be the Most Advanced Showering System Ever. Kohler brings water, sound, steam and light together like no one else in DTV+. It’s our most advanced showering system ever. But that is just the start. 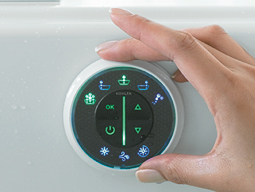 Kohler’s latest generation DTV+ digital shower touchscreen interface lets you control every element of your shower and create a true multi-sensory showering experience. With pre-programmed spa experiences based on actual hydrotherapies. Take your daily shower to another level, and another world. 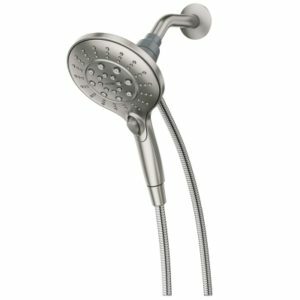 The touchscreen interface provides intuitive control of every component and eliminates the multiple levers and knobs of a manual shower. Six user presets allow you to create and save your favorite experiences. The system is modular by design and entirely customizable, so choose only the options you want. The DTV+ interface drives every aspect of your shower experience. Think of the pre-programmed spa experiences as playlists for your day. Each one targets specific parts of the body with different temperatures and sequences with one touch. Let the power of water, light, sound and steam cleanse your body and mind with pre-programmed spa experiences. Each is based on existing hydrotherapies inspired by one of three themes: Relaxation, Well-Being, and Energy. 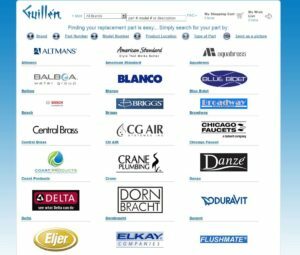 Stop into our Miami plumbing showroom to learn more and take an online tour of all the options the DTV+ has to offer at at Kohler’s official website, here.